Use CWM to load the backup (either blue or pink theme) with the modifying parts like in the description below. This is a backup of my phone with some tweaks as you can see in the pictures. Use the tool i attached (flash tool)for flashing the rom or use CWM to use my CWM backup with the tweaking parts. This Rom has more internal space then the original one. With the old rom i used i had problems downloading from the play store cuz due less space. Also the notifications about battery cover / USB cover water damage warnings are gone. Always make a backup (CWM) of your excisting rom before flashing this one !!!!! I am not responsable for bricking your devices. Hello, am new here. Please will this ROM work for the SM-G900S version? Bonjour je n'arrive pas a flasher la ROM pourtant les specs sont complètement identiques. 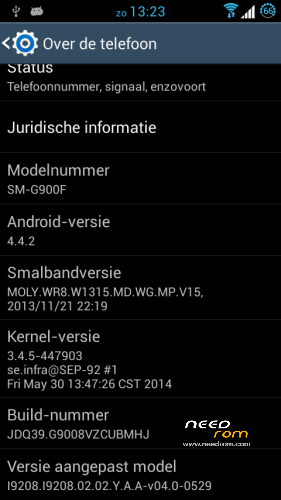 Hi, have you checked this ROM before uploading it because CWM doesnt pick it up at all…. Thanks, worked for me. I thought the phone memory and internal memory are assembled in the CWM backup. Had the hope that then 2.5 GB of internal memory available. Is not so with me. Do you get that too go? Hmm wierd, i couldn’t install apps from the play store first, modified it and now i can download apps again from the playstore without the announcement not enough free space. What if you try to flash the original 1 from my phone with files to flash tool instead of the CWM backup?